During this fourth experience-sharing event within the European Rewilding Network on November 25, the attendants discussed how to develop wildlife watching tourism, and especially so by building and using well-designed wildlife watching hides. The ERN members share information with one another and by doing so get inspiration for the rewilding work that they are involved in themselves. Events like these online webinars are very useful to present and discuss new approaches and novel ideas amongst each other. This webinar covered a number of topics related to the use of different kinds of hides and what it takes to build quality wildlife watching products and business, where hides are often part of the success. ERN members from several European rewilding sites attended the webinar to broaden their own knowledge on the subject. Two presenters passed their expertise on working with wildlife watching in general and also more specifically with hides, after which a vivid discussion followed. First, Staffan Widstrand, Marketing & Communication Director of Rewilding Europe, as well as a distinguished nature photographer and an experienced wildlife hide user himself, provided details on the strategies and technicalities behind preparing successful wildlife watching hides. Various examples of hide types were shown and discussed. Detailed information what to take into account when building a hide, and even detailed technical drawings of a standard hide solution, are also clearly outlined in the guidebook Wildlife Watching Hides published by Rewilding Europe, of which Staffan was the lead author. 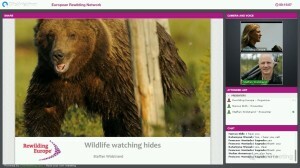 The 4th webinar event of the European Rewilding Network. Then, Marcus Eldh presented some best case examples from his successful wildlife watching business, based on years of experiences building up Wild Sweden of which he is the founder and owner. 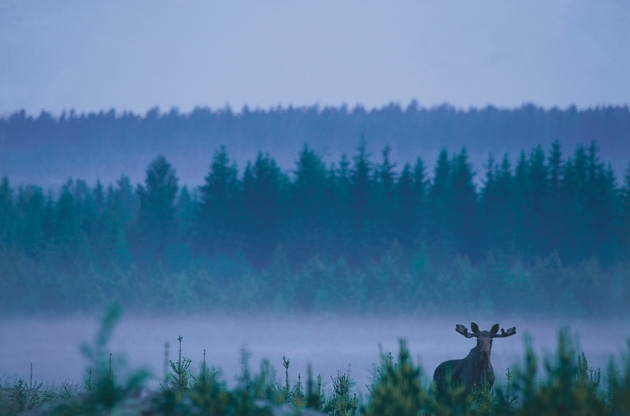 Wild Sweden is a member of the ERN and is an awarded wildlife tour operator which acts as a bit of a role model for the development of sustainable nature based tourism in Sweden. Marcus gave insights into their daily work, that includes providing amazing nature experiences for guests from many countries and cultures, using hides, boats and cars as well as movement on foot, skis and snowshoes. He showed not only the huge potential for the wildlife watching business, but also what it looks like in real life. The attendants actively discussed topics relating to the use of hides, such as how to deal with bears present nearby, and in what cases baiting could or should be considered, and how that should then be done, or not. Experiences were also shared about how to guide guests, photographing while shooting through glass windows or camera ports through the walls, and about watching vultures from hides also during more difficult weather. -“After the recent addition to the ERN membership of a very exciting new project in North-West Poland that aims to contribute to lynx conservation, ERN now comprises of 35 members from 18 countries across Europe”, says Yvonne Kemp, ERN Coordinator. “Several more sites are also about to join, which will enlarge the 1,9 million hectares that are currently covered within the network’s scope. We are now looking forward to our next webinar which will take place early next year”. Rewilding Europe warmly welcomes new members to the network, as we believe that building widespread knowledge about many kinds of rewilding experiences will be useful to all who want to be part of Making Europe a Wilder Place. Please feel welcome to have a look at how your inspiring rewilding initiative could become part of it, at www.rewildingeurope.com/rewilding-network/.